Thanks for all your fabulous comments on the last dress, I'm pretty impressed myself with how it turned out. I actually wore it the other day with some black opaque stockings and a cozy black cardigan so I didn't have to wait until summer after all. I must admit it's a very snug fit because the fabric doesn't have any stretch to it and I've sewn it with very little ease which was necessary to squeeze it out of a metre of fabric cut mainly because I forgot to add some ease since the previous dress I made from the pattern had some stretch to it. However it is wearable since it's sleeveless (ie no restrictions to arm movements) and it makes me stand up straight with my stomach sucked in so it's a good dress for improving my posture too! Winner all round. So I wish I could wow you all with another fantastic dress but instead I've been sewing a skirt. In grey. Hmmm, could be a yawn fest but I'll reserve judgement until I've finished it. What's been keeping me from sewing is the mounds of washing I've been doing lately since Anna decided to start toilet training herself. I was hoping to wait until summer when it would be warmer, but she has started demanding to use the toilet and taking her nappy off so I chose to go with the flow so to speak. She hasn't done too badly so far, just a few accidents here and there when she's been too engrossed in what she's been doing to remember to go to the bathroom. The fun just doesn't stop coming when you have small children does it? Ahhh, much better and my little bookworm likes to gather her toys around in a circle while she "reads" to them from a book interspersed with yelling at them "are you listening to me?" and "I told you to sit still" - I'm guessing that's something she's picked up from daycare because I am a saintly mother that never ever would say something like that! Now I feel like part of the 'it' crowd because every second blog out there features bunting of some sort - it's ultra trendy these days and oh so easy to make. It's in great condition given it's age, except the cream colour paint the previous owner had painted it with has started to peel, so I'm thinking about painting it a vibrant colour. I'll just add that to my to do list. It is the perfect height for Anna to sit in. which is a free download available from here from the Feed Your Soul art project which is a very cool site with loads of awesome free prints. And to up the bunting ante I downloaded some alphabet bunting from Ruffled blog (another free download) to make the word 'read' on the wall - I just love pointing out the obvious! Finally, I sewed some cushion covers from some brand new still in the packet vintage sheets I picked up at the op shop a few months ago. These sheets are so gorgeous, and the cotton so thick and smooth (they aren't made like this anymore regardless of thread count) that I was hesitant to cut them up. But they aren't quite big enough for Anna's single bed since we bought her a very luxurious pillow top mattress - mainly for my comfort since I've spent many nights sleeping in there with her! Plus I figure this way I get to see the fabric rather than have it hidden away on a bed somewhere. There's heap of fabric left, so no doubt I'll make these into little dresses and pyjama pants and anything else I can think of. Thank you for letting me share this little tour of my house with you - I tell you sewing home dec items is far more enjoyable when the outcome is so cute! SewRedHot: Birkenhead Point Spotlight is the closest to my house but I shudder at the thought of going there because it's small, messy, overcrowded and has the worst customer service. I usually go to the newish store at Lidcombe which is a little bit further away but I can bribe Anna with a stop at the playground at Bicentennial Park on the way home if she behaves while I shop! I haven't been to Rockdale for ages, but I'm sad to hear it's not the cavern it used to be. Gail: I did pop into the Lincraft store in the city to check out their sale, but that place was craaazzzy with the line for the counter nearly out the door. I decided 50% off their mostly horrible fabrics was just not worth queuing for. Littlebetty: it won't be too long before Spotlight has a 20% off everything sale, I always wait for their sales too since they're so frequent! I originally bought it to make a dress for Anna, but then I thought the fabric was too nice for a 2 year old's dress who would either grow out of it quickly or ruin it so I decided to make myself a top instead, probably a sleeveless shell top like one of these I made recently. Luckily I didn't get around to making something from the fabric too soon, because after making that last New Look dress I thought a dress would be better because then the fabric in all it's prettiness could be seen instead of being hidden under a suit jacket. See there is a good reason for stashing your fabric! Please excuse the flash photos, but we're having torrential rain and extremely grey days at the moment so it was the best I could do. In fact I cranked up the heater just to take this photo, and I have no idea when I'll be wearing this dress out, although I could layer it up big time and just dream of summer weather. To say that I love this pattern is an understatement, Carolyn and Judidarling you are both so right when you say this could become my TNT dress pattern! I managed to cut out and sew this in two evenings (about three hours in total) because it is such a simple but well fitted pattern. Because I only just squeezed the pattern pieces out I didn't even try to match the print figuring that the print was so busy no one would notice, so that saved a fair amount of time (and sanity!) just sewing the side seams without trying to line up the print. although to be honest it's probably only perfectionists that sew our own clothes that would either notice or care. But I do think that a dress with a waist seam looks better with a belt or tie of some sort around it, so I'll wear it belted regardless. The pattern called for lining the bodice only, and sewing on neck and sleeve facings, which I found a little bizarre because from what I could see the lining extends to the neckline and the facings are just sewed onto the lining. Instead I chose to fully line the dress, leaving off the facings and constructed it using the sleeveless dress lining method (ie sew at the neckline and armholes, turn inside out, sew the centre back zip and then the side seams absolutely last). So all in all I am extremely glad I made this pattern acquisition, even though my pattern stash is out of control and I am trying hard not to buy more! Jacquie - I'm ashamed to admit that I rarely leave Spotlight without purchasing a fabric, even if I have only popped in there to get a zip or some thread! They do have a large range of fabric which makes me feel sad for all the cotton and other fibres that were sacrificed to create such ugly fabrics, but at the moment they do have a lovely range of stretch cotton sateens and some printed cotton lawn that they are claiming to be Japanese. I'm also lucky that my local Spotlight is relatively new so it is spacious, well laid out and generally tidy so you can actually see all the fabrics. Katherine H - I too love Cue and I have a few of their suits because I think its worthwhile investing in a well fitting suit, but otherwise I find their clothes extremely expensive for what they are. But thank you for the lovely comparison! KID, MD - thank you for naming the 'ink blot' tests, I never knew what they were officially called but now I do. And Jean, you crack me up! And Cidell and Sewingprincess, what can I say? Thank you so much for the very flattering comments - you both made my day! Lizzie - I sewed this dress using the sewing machine since I didn't do a muslin and wasn't brave enough for the finality of an overlocked seam. I did overlock the seam edges, though that probably wasn't necessary since I don't think fabric will fray. Just habit I guess! Katherine H and Dilly - I don't know anything about knit linings or how knit linings work I'm afraid, I've never actually sewn a knit garment with a lining (actually I sewn very few knit garments at all). But I do have a RTW suit that is made from a stretch lycra/cotton blend, and it has a lining of knit (sort of like matte texture swimsuit fabric) and it seems to be sewn the same way as normal. Anyone else have any tips on how to line a knit dress, or better question do you ever bother lining a knit dress? Anonymous - the next time I wore this dress I did wear an old fashioned slip under it, and it worked fine. And thanks for the tip on using whisperweft for the interfacing, I do have some stretchy interfacing I picked up from a garage sale one time, but it's quite stiff so I can see that whisperweft would be a much better weight. And Trena (aka the Slapdash Sewist) - this whole post is dedicated to you! I've used New Look patterns in the past that have ended up as shapeless potato sacks, so I was pleasantly surprised how this one turned out. I did completely ignore the pattern sizes though and instead went off the finished garment measurements and used nil ease since this was a knit fabric. 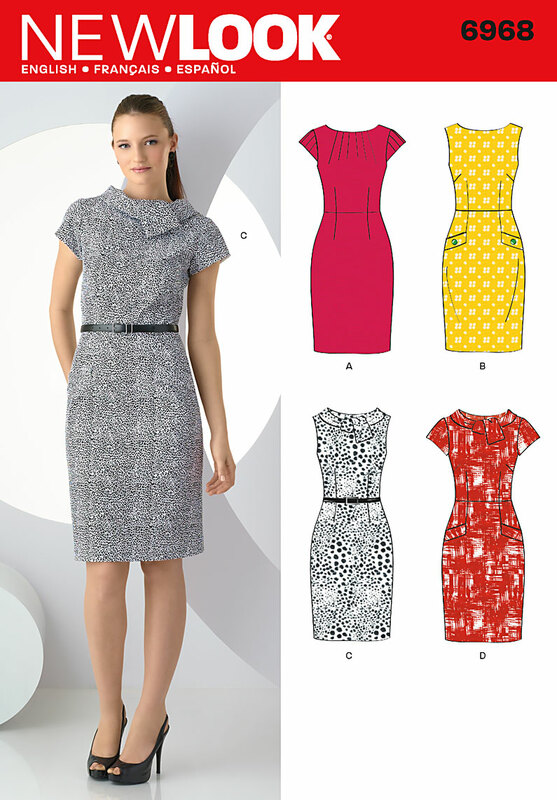 To test whether this was a one off miracle for New Look, I've just made another New Look pattern I picked up at the same time: New Look 6968. It still looks good hidden under a jacket, that neckline tie peeks out nicely and is like wearing the accessory you're wearing when you're not actually wearing any accessories! I'm so hopeless at remembering to put necklaces on in the morning and Anna is good at fiddling with them until they break so I really like this tie detail. So moral of this post: don't overlook New Look, there are some hidden gems amongst their offerings. Plus they're (generally) really easy to make, which makes a nice change sometimes. Although it's not that snug under *ahem* my bottom, the wind had just started blowing which is also why the collar has flipped up at the back. It also explains the look on my face - it was cold outside without a jacket on! The pattern doesn't instruct you to interface the collars, and I left it out because I thought that six layers of fabric at that centre front neckline (the two collars, dress and facing) would be thick enough without two layers of interfacing as well. But now I think I should have because the collar is a little floppy and I find myself adjusting it frequently, for a knit fabric like this it would have better staying power if it was reinforced. I didn't sew on a button on the collar as per the pattern because I wanted to wear it with one of my many brooches instead, but of course today I forgot to wear one! It still looks good without button or brooch though. The sleeve cuffs are interfaced, and they sit much better than the collar. I used some fabric covered buttons for the cuffs which I think works well with the sixties style of the dress. The only thing I don't like about this dress is that I made it unlined as per the pattern instructions. Normally I do line all my dresses because I think it makes them more substantial and I always wear pantyhose to work so it is necessary. But I didn't have any stretch lining in the stash, and I didn't want to interfere with the stretch of the dress fabric so I left it out. I've worn it today to work with a body shaping slip underneath, but I can still feel the hem of the dress sticking to my knees and riding up a little as I walk. A lining would also eliminate the flippy floppy neckline facing too. The next version I make (and yes I am already going through the stash to find the right fabric) I will make a full lining and eliminate the facings. But all in all I love this dress, particularly this deep purple colour - I wasn't brave enough to go red like the pattern photograph but the purple is still an eye catching colour. 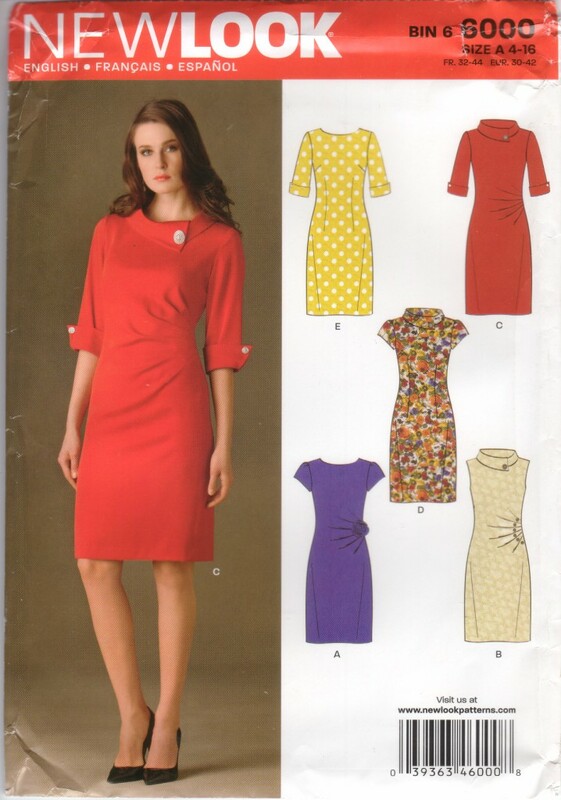 I particularly like the elbow length sleeves which are just perfect for winter and very flattering too. And aren't these photos great too? I wish I could claim credit for them, but they aren't my new found skills in action but rather those of my very talented colleague Ann who took these photos outside our office for me this morning - I thought you'd all appreciate a different background to my living room for a change! That's the Hyde Park Barracks you can see behind me, a convict building built in 1819 and is now World Heritage listed (and that's history lesson for today!). Anna has a CD full of children's songs which includes the very annoying song "there's a hole in my bucket, dear Liza, dear Liza....". Please forgive me if that line is now stuck in your brain, because it's been looping around on replay on my internal ipod for a few days and is driving me nuts! After many washes and soaks in whitening powder, this simple white shell top made from a white cotton waffle weave finally waived sayanora with a little tear in the neckline in the centre front. I made this many years ago, pre blogging days in fact, so I certainly got a lot of wear from it. I suppose I could have undone it and cut the neckline a little lower than that tear, but that probably would have taken more time to do than just to sew a new one. So I just made a new one. In fact I made two new ones, because even though this is just a plain sleeveless shell top it's actually quite a versatile garment: I wear it under suits because there's no bulk or collars to worry about, it looks good with full skirts because it's quite fitted and it even wears well with jeans because it's long enough to wear with mid rise cuts. 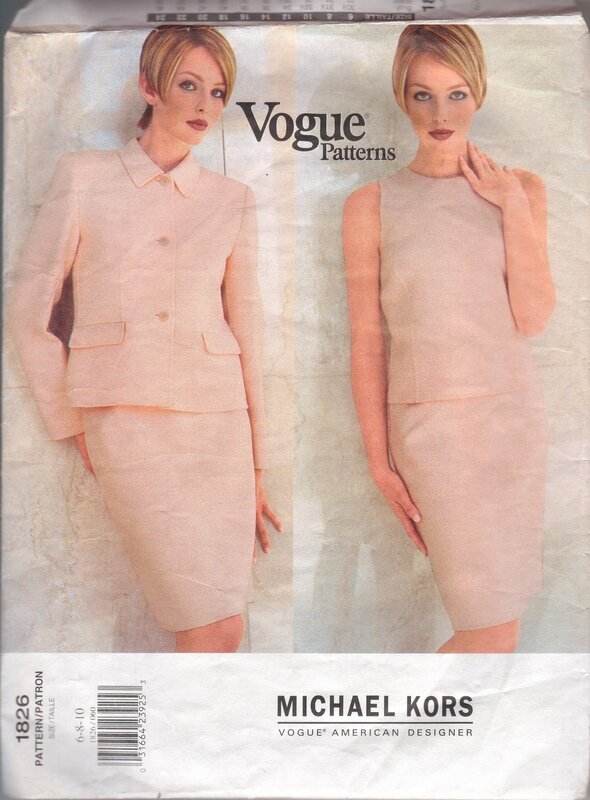 Using Vogue 1826, an OOP Michael Kors pattern, I made a replacement one in white from another piece of textured cotton I had in the stash. Actually this is a remnant from another white shirt I made, because this top is sleeveless, collarless and princess seamed there are only four skinny pattern pieces and I can eek it out of the smallest amount of fabric. The pattern calls for a zipper at the centre back, but I like the look of the buttons so that's what I went with instead. The top is fully lined with a thin white cotton poplin, and I made this using the method for lining sleeveless dresses - sewing the side seams last and pulling the back through the shoulders. I also bagged the lining and sewed the buttons on by the machine, which meant that this top was entirely done on the machine - so much quicker than hand sewing that's for sure. These two tops are actually versions 4 and 5 that I've made from this pattern, with the original white top being the first, a black one the second and white/beige print the the third, but I doubt they'll be the last!